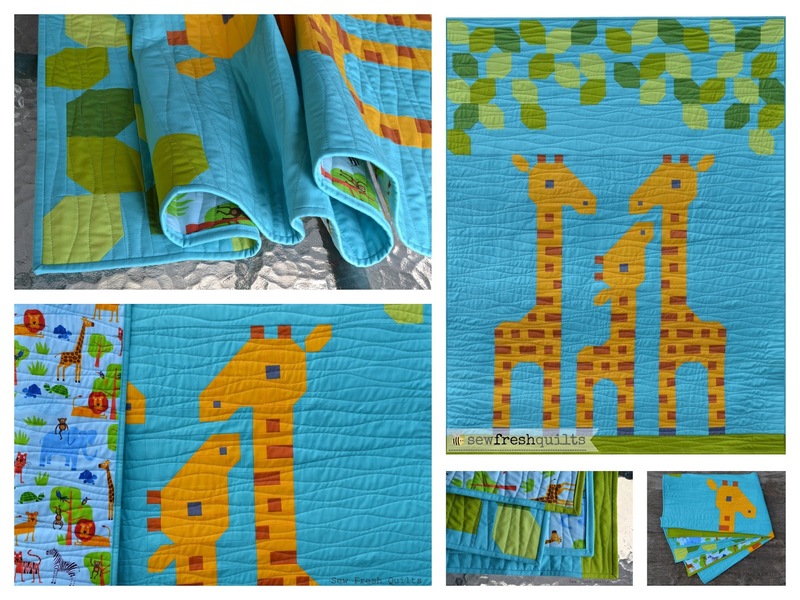 Introducing Sew Fresh Quilts new pattern – Jungle Friends! I am so excited to have completed both the Twin and Baby size versions of the Jungle Friends pattern in time for a Friday finish! First and foremost, I want to thank those of you who have been eagerly awaiting the release of this pattern. All your encouraging comments here on the blog as I have shown the progress of the blocks as they were being made and over on Instagram and Facebook. THANK YOU ALL SO MUCH!!!! The response has been overwhelming! "Jungle Friends" in TWIN Size finished at approximately 72" x 96"
Here is a photo of the finished quilt draped across my twin size bed. Thank you also to Northcott Fabrics!!! 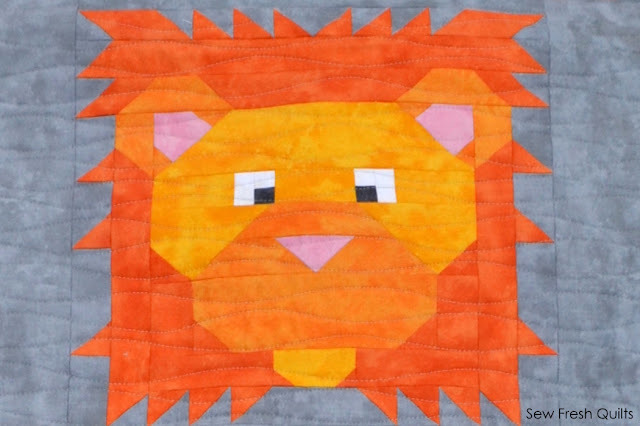 These Jungle Friends quilt projects have been generously sponsored by Northcott Fabrics. The quilt tops are made entirely from Northcott's signature collection Toscana basics. And the backing is from the Artisan Spirit Painter's Palette collection. 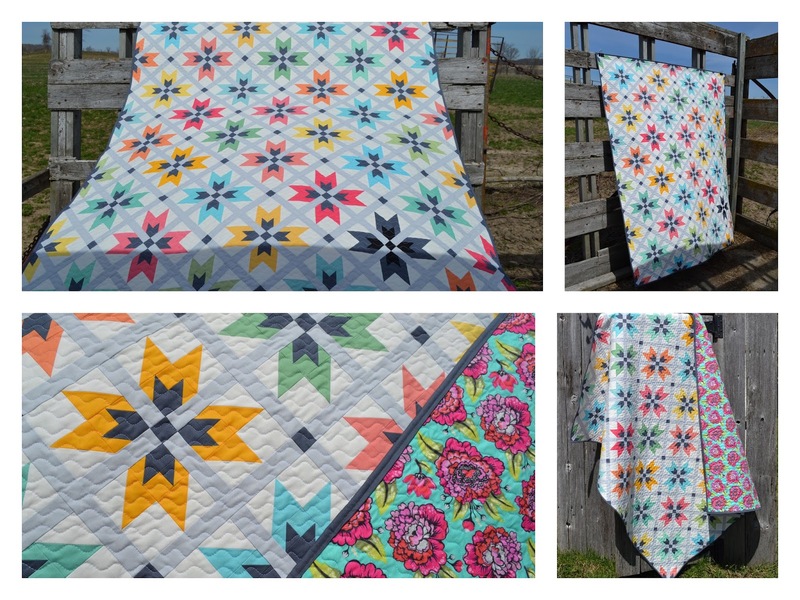 I loved working with the Toscana line and am so happy with the overall look and feel of these quilts! "Jungle Friends" in BABY Size finished at approximately 40" x 52"
And the Artisan Spirit Painter's Pallette backing? Delightful! This backing blends well with the choices from the front and added a beautiful brightness to contrast with the dusky feel of the front of the quilt. I am just so happy with both of these finishes! 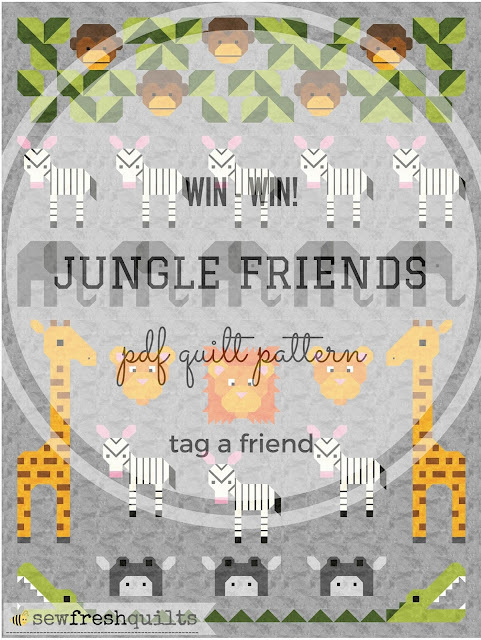 Jungle Friends is a sampler style design with a safari theme and features animal quilt blocks made using traditional piecing methods. No templates. No paper piecing. Only simple straight line sewing and diagonal seams. Easy to follow instructions are provided for every step of the way! The Jungle Friends pattern includes material requirements lists for both the TWIN and BABY size settings and charts for each quilt block. The Jungle Friends quilt pattern consists of the following sized quilt blocks: Monkey 8” wide x 7” high, Zebra 12” wide x 14" high, Elephant 12” wide x 10" high, Giraffe 12” wide x 34" high, Male Lion 12” wide x 12" high, Female Lion 10” wide x 9" high, Crocodile 12” wide x 10" high, and the Hippo blocks finish at 12” wide x 6” high. This allows for a variety of settings in which your blocks can be used to make cushions, place mats, table runners, wall hangings or quilts from baby to big. Adding wider sashing and borders will also help you to adjust this pattern up to the size you desire. 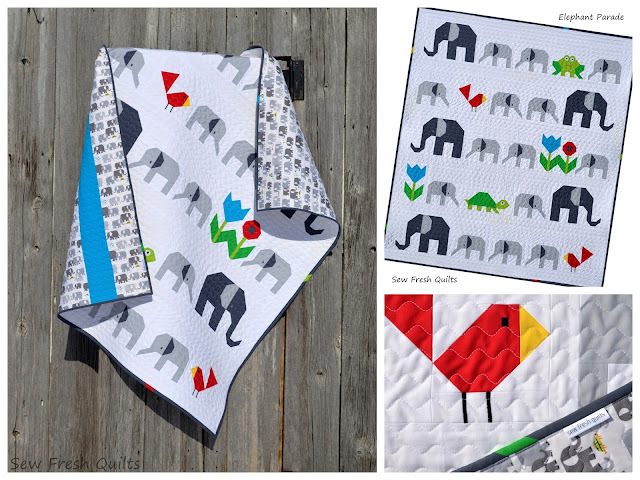 The Jungle Friends pattern gives instructions for making all of the individual quilt blocks and provides additional information for the sashing and borders to make the above settings in BABY or TWIN size. But it is up to you to choose whether to use the layouts shown previously or to design your own setting to suit your particular application. The Jungle Friends 33 page pdf quilt pattern can be purchased here. There has to be a GIVEAWAY!!! I am offering 3 free JUNGLE FRIENDS to my friends! And one for each of THEIR friends! First chance to win is to enter the contest using the RaffleCopter below. Second chance to win is to head over to Instagram here and tag a friend. Third chance to win is to head over to Facebook here and tag a friend. You can tag as many friends as you like! Each will count as an entry. And each like, share or repost will also count as an entry. Winner will be randomly chosen on January 15th and notified by email. You will be provided with a full refund!!!! The Jungle Friends blocks were all completed when I made my report for the Let's Bee Social last week. Then they were all sashed and borders were added. The Baby sized quilt was easily basted and quilted up here at home. But the Full sized quilt finishes at approximately 72" x 96", so I hauled that one and the backing and batting down to church on Saturday and made use of their great big tables in the basement. Here is a photo of it draped across a twin bed before quilting. Are you on Instagram? Come visit me here! Fingers crossed to soon have a finish post announcing the Jungle Friends pattern release!!! The quilts are both completed. Just trying to figure out a way to get photos outdoors in this weather. 2015 has come and gone. A year of finishes and a year of firsts. Looking back through my gallery of finishes for the year as I prepared this post, has also prompted me to reflect on all the changes that have been a part of things here at Sew Fresh Quilts during the last 12 months. And all of the things that I am so thankful for. 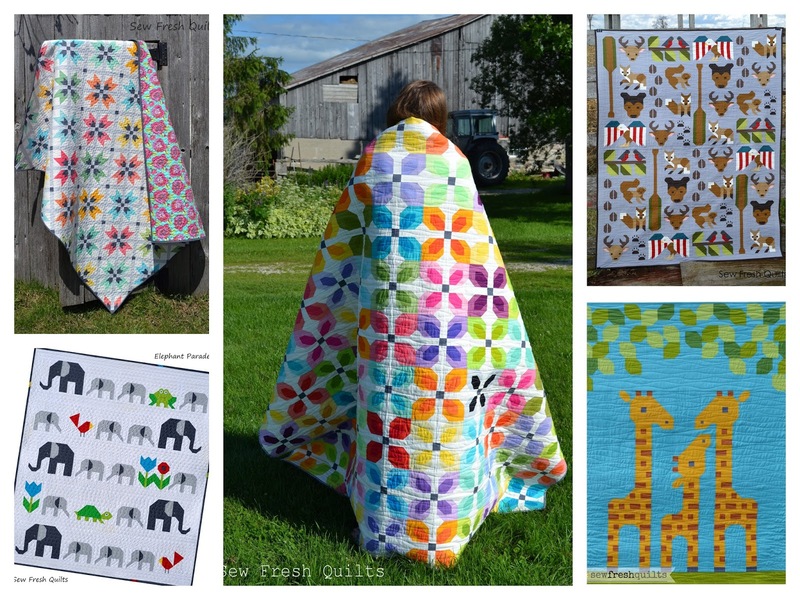 In January of 2015, I announced that I would be hosting the Elephant Parade quilt along. This quilt along ran from the beginning of February until end of March. Now this was not the first quilt along I ever hosted. But it was the first one that I would consider to have been a real success. This quilt along was a wonderful opportunity to make so many new friends from all over the quilty universe. It was such a great pleasure to see the projects everyone was sharing and read about how much fun they were having in making those elephant mamas and their babies. And this was the most fun I had all year! Another finish from the past year was my On Point quilt. This was not my first time making the blocks that were used in the quilt, but it was the first time they were used in an on point setting. This was also my first time making a quilt sponsored by the Fat Quarter Shop. This quilt helped to reinforce my love of making all solids quilts. 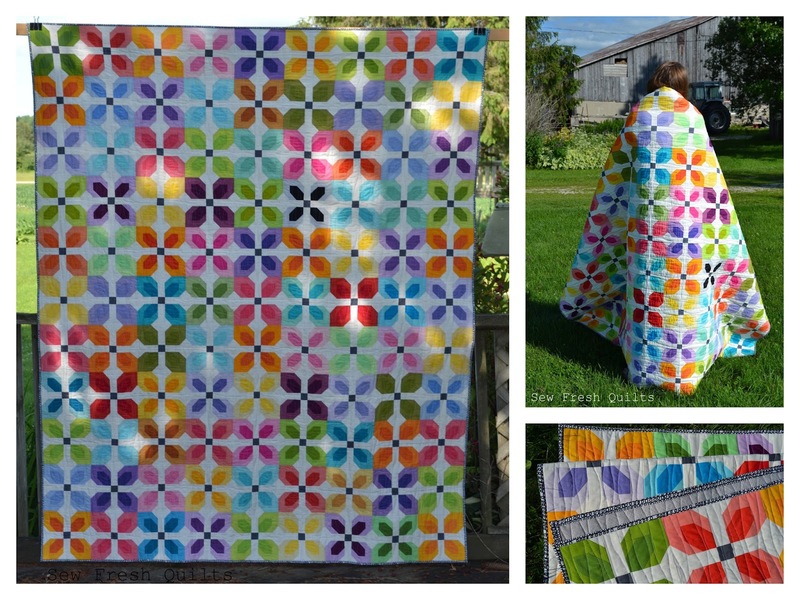 Speaking of all solids quilts, a personal favourite of mine from 2015 is my Kona Little Blooms quilt. Again, this was not my first time making the blocks that were used in the quilt, but this was the first time they were made entirely from solids and used in a full size quilt - 99 blocks in all. This is a quilt that just simply makes me happy. Those scrappy, bright blocks, framed by that black Scribbles binding, take me back to my own childhood and make me thing of how much fun it was to break into a box of Crayola crayons and a fresh, new colouring book. This quilt, and the photos from that warm summer day out on the front lawn with my kids and that cat, just simply make my heart happy. When it comes to baby quilts, the Family of Three was my most treasured make of the entire year. This quilt and the instructions for making it can be found in the January/February 2016 issue of Quiltmaker magazine. This quilt was based on an earlier design and was then redeveloped to include the entire bodies of the giraffes. 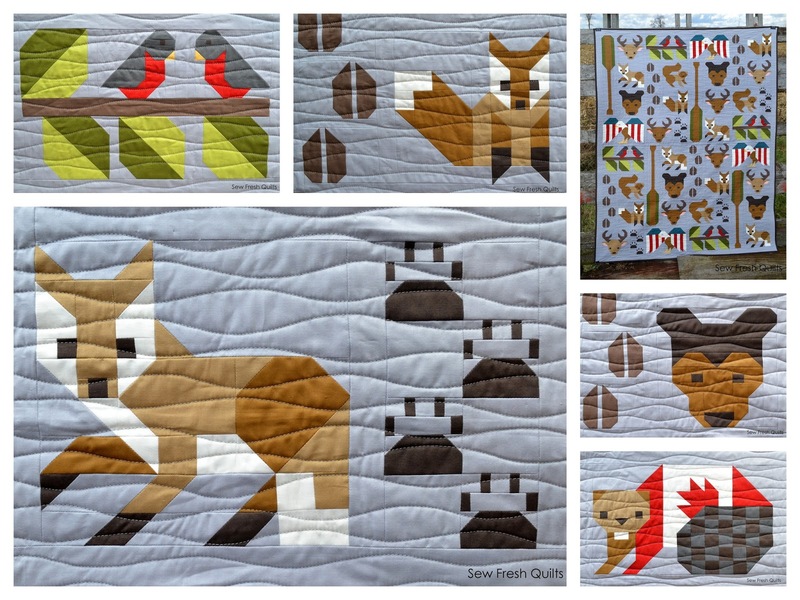 Reinforcing my desire to design animal blocks, my most cherished make of 2015 has got to be the Forest Friends quilts made using the soft and supple selections from the Cotton Couture collection. Sponsored by Michael Miller Fabrics, these forest animal themed blocks were used to make a twin quilt, a baby quilt and a number of quilted cushions. The development of this quilt design has shown me that blocks do not need to be of the same size to be used in a quilt using a setting of simple rows and columns, but rather that those blocks can be used to make panels. The blocks within those panels can then be rearranged to create a setting that is rather unique. 2015 has been a pivotal year for me. A year of finishes and a year of firsts. But also a year of refining my FOCUS. In the first couple of years, I concentrated on learning new techniques, sharing tutorials and quilting tips, and developing my own artistic style. 2015 was the year I discovered that my true passion lies in designing modern minimalist pictorial quilts using the STOP (stitch-trim-openseams-press) method. That discovery has become my focus. This is my niche. My happy place! Back in May of 2014, I shared a post in which I had interviewed some very well known (and a few not -so-well-known) quilting bloggers, asking them to share a word of advice. The question posed to them was, "What is the most important quality for an emerging quilting blogger to possess?" The purpose of this post was, of course. to share their advice with my readers. But it was also to take what they had shared and apply it to my own life. my quilting/blogging life here at Sew Fresh Quilts. I am very thankful that they were willing to provide a few words of wisdom to share with my readers.... But I also learned a lot from performing this interview, and since then, I have striven to put this great advice to good use. During the 100th post for the Let's Bee Social, which you can read in full here, I mentioned my Giraffe quilt would be in the Quiltmaker's January/February 2016 issue of their magazine. And I basically said that I did not wish to toot my own horn concerning this achievement. The response was overwhelming. You encouraged me to embrace and be proud of being published. Your heartfelt comments of praise and kindness are truly appreciated and I have taken them all to heart. With your permission, I promise to embrace any future publications or accomplishments and to be proud of them. However, in that post I expressed my intention to stay on my own course. To not lose my perspective. And to remain humble. Not to change my style of making to suit the quilty powers that be. Not to make something in an attempt to seek the approval of others or to fit this square peg that I am, into any big, round hole that is popularity. I remain resolved to stand behind this conviction. Believe me. You won't be reading any posts or seeing any projects during the coming new year that are not in tune with this conviction. The team at Quiltmaker made me feel like a part of the family. They treated me well. They did not expect me to change my style or to make something to suit what is considered right or popular or modern. They simply invited me to submit designs. They accepted those designs without modification or complaint of any kind. And then they did something a little extra special. And it meant an awful lot to me. They shared my work on their social media in a way that went above and beyond the self promotion of their magazine. It came across as genuine admiration. And I am truly thankful for their kindness. The year 2016 will be.... The YEAR OF FOCUSING ON DESIGN! But also a year of branching out into the REAL WORLD. In the first couple of years, I read about quilters who banded together. Those who enjoyed the company of others. Those who met with quilty friends or were members of real life groups and guilds. Although I have developed a lot of close friends through the internet and enjoyed meeting other like minded quilty peeps through the Let's Bee Social - I remained alone in real life - shut up in my own little sewing room. During the past year I have branched out of my safe zone and ventured out into the real world. I reached out to groups and guilds in my area and the word is getting around. My events page now lists a lineup of upcoming workshops and trunk shows that will take place in the coming new year. And below that are listed a few events that I was delighted to have taken part in during 2015. I am thankful for the friendships that have been formed through my interactions with followers of this blog and the participants of the Let's Bee Social. Your support and your kind comments left on my post each week are appreciated more than you know. And I want to thank you all for providing me with the courage to reach out beyond the borders of the internet and for inspiring me to connect with people in my area who I otherwise would never have met. The year 2016 will be.... The YEAR OF Sew Fresh Quilts ON THE ROAD! But also a year of hosting fun QUILT ALONGS. Hosting the Elephant Parade and then the Dog Gone Cute quilt along has been the most fun that I have had during the entire year. Because of that fact - I will definitely be hosting a few more quilt alongs in this new year. What the quilt alongs will be is still yet to be determined. I have added a new Quilt Alongs page tab at the top of my blog, just below the header. Here you will find links to both the Elephant Parade and the Dog Gone Cute quilt alongs. And all the future quilt alongs to come in this New Year. The year 2016 will be.... The YEAR OF THE QUILT ALONG! Linking up with Yvonne of Quilting Jet Girl for her 2016 Planning Party. It's not to late to join in the FUN! Write your own post for your Plans for 2016 and come join the party! 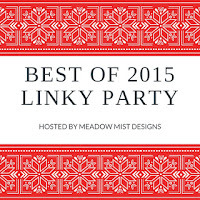 Linking up with Cheryl of Meadow Mist Designs for her very first linky party. It's not to late to join in the FUN! Write your own post for your Best of 2015 and come join the party! Cheryl is also hosting a NEW Pattern Writing begins in January. 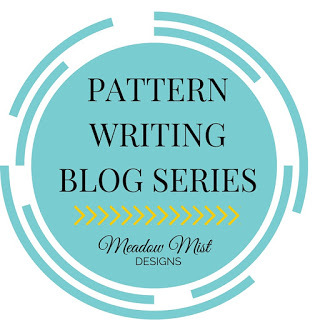 Be sure to sign up to follow her at Meadow Mist Designs for what is certain to be a very informative and interesting series for those of you who have ever thought about developing your own patterns. Or ever wondered just what is the process for pattern writing. Do you have any suggestions for a quilt along? Looking forward to quilting along with you in 2016!!! Happy to report that ALL of the blocks for both the twin and baby size Jungle Friends quilts are finished! Sashing and borders are currently being added! I want to thank you.... Thank you!!! 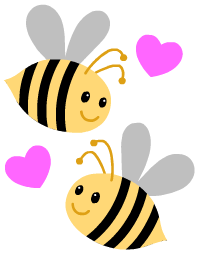 This is the official post marking two years of the Let's Bee Social linky party! This party would not be what it is today if not for you. Your willingness to share what you create. Your willingness to bee social and share kindness with everyone you visit. You are such a wonderful gift to me.... Sweeter than honey and more fragrant than flowering blooms! My first post was written on December 24th of 2012. It was more of a New Year's resolution post than a quilting post, but I kept my promises to myself and then made another New Year's resolution type post the following year. There was a Let's Bee Social post made on December 24, 2014, but no New Year's resolution. Just simply a celebration much like this one here. Three years of quilting/blogging has meant an accumulation of lots of stuff. Fabric of course. And many, many quilts. Three years worth of experience and knowledge. But best of all, three years has given me the opportunity to make so many, many friends. You are my friends and what I treasure above all else in this journey. Your friendship, love and support are what I am truly thankful for this Christmas. You are a gift that is greater than gold - or even fabric! Having friends like you is what has kept me going through the last three years. And what makes me look forward to the many years to come! NOW it's your turn for Show and Tell!!! 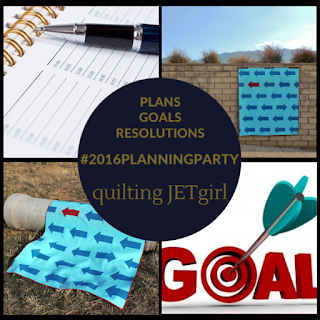 Yvonne of Quilting Jet Girl is hosting a planning party!!! 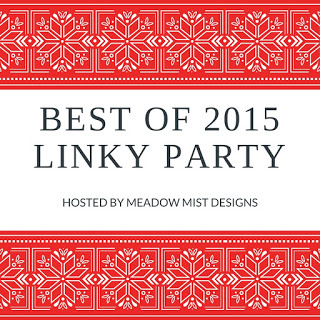 Cheryl of Meadow Mist Design is hosting her first linky party!!! Wishing you and yours a VERY MERRY CHRISTMAS, my friends.